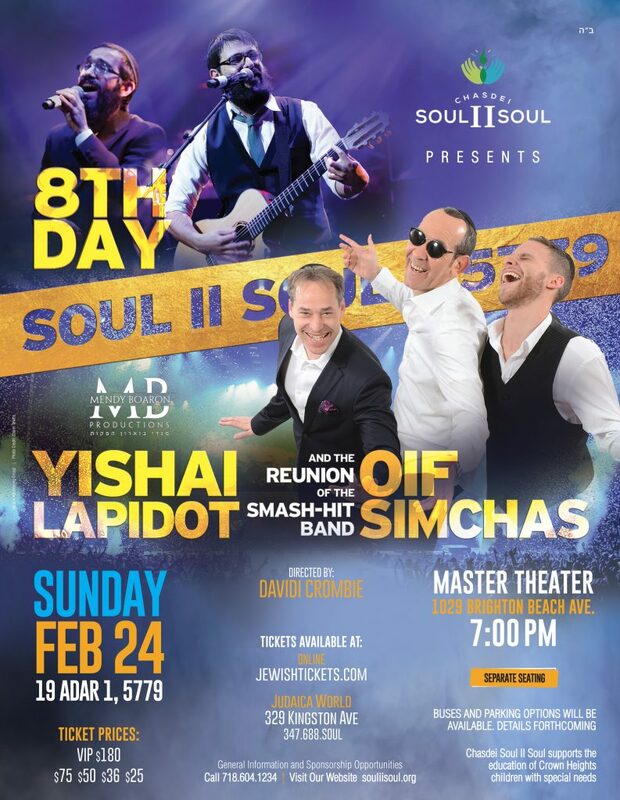 The wildly popular 8th Day Band, led by the rocking duo Shmuly and Bentzi Marcus, will headline this year’s Soul II Soul concert on February 24, 2019. The concert will also feature the return of the hit music group Oif Simchas, led by the one and only singer and entertainer Yishai Lapidot. 8th Day will perform their classics such as “Yaalili,” “Babenyu” and “Hooleh,” as well as new songs from their new hit album which recently made it to number 1 on iTunes world music chart. The two bands will headline the highly anticipated concert which raises funds for the education of children with special needs. This year’s concert will take place at a new, larger venue, at the Master Theater at 1029 Brighton Beach Ave, Brooklyn, NY. The concert will be produced by Mendy Boaron of MLP Lighting, with musical production by Davidi Crombie. An all-star band, full scale lighting and video production will round out what promises to be a night to remember. Tickets go on sale on January 28 at Judaica World and Jewishtickets.com. Sponsorships, which include a VIP pre-concert reception and premier seating, are available by calling 718-604-1234.